The Liberal National government has used National Homeless Week to announce legal changes to empower the police to evict the homeless, and some of the most disadvantaged in our communities, from public land in the City of Sydney. The Greens believe that having access to a safe and permanent home is a fundamental human right. The parliament has a responsibility not to enact laws to facilitate harassment of homeless people, but to help them by providing permanent housing and to ensure those at risk of homelessness get the support they need. The Orwellian ‘Sydney Public Reserves Public Safety Bill ‘was introduced to Parliament today, shortly after Greens Member for Newtown and Homelessness Spokesperson Jenny Leong was removed from the chamber for calling out the spin being presented by the FACs Minister. “Today’s announcement will do nothing to address the issue of homelessness or provide permanent housing for the homeless community at Martin Place. “While this Liberal National government may be doing everything they can to avoid the reality faced by so many people who are homeless in our community, we will continue to pressure the government to act and implement real solutions. “There’s a tried and tested solution to addressing homelessness and that is using the Housing First model – an approach which provides permanent housing to those who are homeless as a priority. 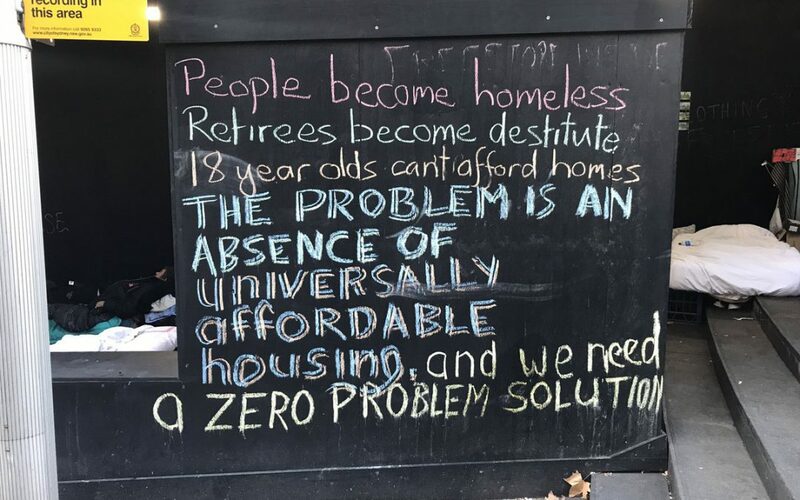 “People are sleeping in tents in Martin Place because the Premier and her Liberal National government have failed to provide proper support services or enough public and social housing. No one else is to blame but them.” Ms Leong said. “What is really offensive is that the Premier’s first answer to a social problem is more police powers. “It’s National Homelessness Week and the Liberal National government plans to empower the police to evict the homeless from public land in the City of Sydney. “Let’s be clear once these laws are in, they can be used not just to remove homeless people from the street, but could be targeted at anyone they want to see removed from a public place. “Crown Land laws exist to ensure that that public land is properly managed for the public benefit, not to evict homeless people sleeping rough in the city because it makes the Premier ‘uncomfortable.” Mr Shoebridge said.